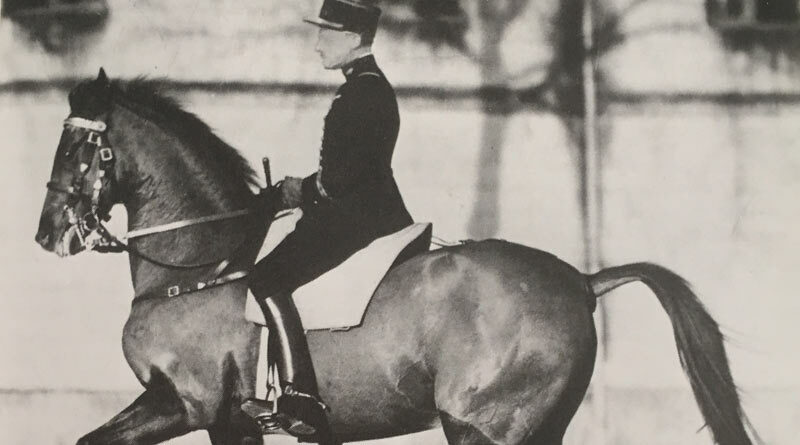 Capitaine Lavergne of the Cavalry School, Saumur, demonstrates Piaffe. In the dreams of our youth, glory in the show ring and love for the horse are compatible. But soon, showbusiness places the ego above the love and the winning addiction skips love for glory. Friendship and tenderness are treated as weaknesses. I remember a trainer telling me, “You cannot love the horses and win.” The thought crossed my mind, that lack of respect and love for the horse was likely the reason why he did not win that often. It takes a long time to complete our adolescent dream. Effortlessness, elegance, ease, efficiency and soundness rests on a partnership where skill and extensive knowledge guide the horse’s brain toward a body coordination that allows the horse to perform soundly at its full potential. It takes a long time to change our core beliefs. Advanced knowledge often shatters our most engrained opinions. As knowledge evolves constantly, it takes a long time to realize that like in physics, the joy is not executing the move, but instead, educating the horse to get there. “The Joy of Physics Isn’t in the results, but in the search itself.” (Dennis Overbye) Once we reach matured intelligence, ethic, respect for the horse and knowledge, we can fulfill the dream of our youth, but winning is no longer about the ephemeral glory of the show ring; winning is about a horse performing a move at ease, effortlessly and soundly. The horse’s fountain of youth is the rider’s knowledge. A horse ages very fast when it is forced to repeat movements it is not properly trained for, but a functional horse maintains for a long-time elasticity, power, stamina and intelligence. Dressage movements were originally gymnastic exercises preparing the horse for war, sport and entertainment. The movements have become defined for fashion instead of education. A horse ages very fast when ease is misunderstood as relaxation, when elasticity is interpreted as stretching. Instead, a horse remains young, keeping muscles and bone density when elasticity results from tensegrity, elastic energy and adequate tension of fascia. A horse ages very fast when the work of the thoracolumbar spine is interpreted as a swinging back. The whole concept of swing and stretching and relaxation dates from the age where the naked eye and the incapacity of the naked eye to register fast movement, was the only scientific reference. A simple look at the major component of elasticity, the cytoskeletal proteins known as filaments titin, demonstrates that elasticity is not the result of slackness but instead nuance in muscle tone aiming at supple resistance. “The elastic property of vertebrate myofibrils is thought to be due in large part to the enormous cytoskeletal protein, filament titin.” There are multiple titin isoforms that vary in size and stiffness. This explains why there is a large diversity in elastic stiffness across vertebrate muscles. Elasticity is the outcome of supple resistance. Tendons, aponeurosis, muscles, fascia, store elastic energy resisting elongation. It takes a long time because intuitive riders, the ones who “feel” that the horse talks in a different dimension, have first to take conscience of the incompetence of conventional equitation. They have to swim in the horse’s silence before hearing his voice. They have to refuse principles of conventional equitation without really knowing why these principles are heretical. Paraphrasing Albert Einstein, they have to believe in their intuition as a sacred gift in a world of faithful servants. The faithful servants, the ones who apply the principles of traditional equitation, do not listen to the horse; they submit the horse to their beliefs. They repeat the principles of classical equitation because they have been told to do so and they accuse the horse of misbehavior when the horse resists established beliefs. They rock themselves into an oxymoron. A horse does not control balance by shifting some weight backward. The concept of weight transfer, which is still taught today, does not exist. For decades, studies have measured and demonstrated that in collection, a horse does not increase the weight on the hind legs. Instead, the horse increases the length of time the supporting hind leg is on the ground. The horse increases the duration of the hind leg decelerating phase. During piaffe for instance, the decelerating activity of the hind legs is considerable, resisting the forward shift of the body over the forelegs. The duration of the decelerating phase is greatly increased while the propulsive phase is greatly reduced. The red line illustrated the necessary “neutral” balance of the rider. The front part of the rider’s shoulders, the middle of the spine, the seat bones and the stirrups have to be on the same vertical line. Any shift of the rider’s weight back to front would hamper the ability of the horse’s back muscles to convert the thrust generated by the hind legs into greater upward forces. The propulsive activity of the hind legs occurs during the second half of the stride, as the hind leg approaches peak vertical and gradually moves backward behind the horse’s body. The thrust generated by the hind legs travels forward through the thoracolumbar spine where it is attracted down to earth by gravity. The back muscles resist attraction of gravity converting part of the initial thrust generated by the hind legs into upward forces. During cursorial locomotion, the thrust generated by the hind legs is converted by the back muscles into horizontal forces, forward movement, (green arrow) and upward forces, balance control, (red arrow). When the performance demands greater balance control, the same initial thrust generated by the hind legs is converted by the back muscles into greater upward forces, (red arrow). The drawing of the back longissimus dorsi muscles, the ventral element as well as the dorsal element was made by L. J. Slijper in 1949. Great progress has been made since. Not in the shape and direction of the fascicles of the longissimus muscles, which remains accurate, oblique, down and forward, covering three to five vertebrae. The progress has been made understanding their function; how the back muscles convert the thrust generated by the hind legs into upward forces. We are far ahead of the bow and string concept, suggesting that the horse’s lower line, pectoral and abdominal muscles, flex the upper line. The bow and string theory pretends that the muscle held between the fingers of the pathologist, the rectus abdominis, has the capacity to flex the enormous mass of the back muscles illustrated on this section made at the level of the second lumbar vertebrae. The dorsal and ventral division of the longissimus dorsi coordinated with the stabilization’s work of the multifidius, are the muscles converting the thrust generated by the hind legs into horizontal and upward forces. Balance control resides on the riders’ ability to influence the work of these back muscles. In the 17th century, the Marquis of Condorcet believed that the study of anatomy was already completed. Dissections showed the attachment and insertion of the muscles and rational thinking deducted their function. Many equestrian theories remain at this level. Since then, phenomenon totally unknown by our predecessors expose a totally different picture. “Most of the length change required for the work of locomotion, occurs not in the muscle fibers themselves but by elastic recoil of the associated tendons and muscles aponeurosis.” (The role of the extrinsic thoracic limbmuscles in equine locomotion. R. C. Payne, P. Veenman and A. M. Wilson. J. Anat. (2005) 206, pp 193-404). The thought that lowering the neck is going to properly coordinate the function of the back muscles is irrelevant. Tensegrity, elastic energy, and work of the fascia cannot be coordinated through neck posture. The theory that amplitude is related to greater swing of the thoracolumbar spine is contradicted every day by new knowledge. The swinging back theory was already contradicted by Hans Carlson’s, 1975 electromyography study. There, the Swedish scientist demonstrated that the primarily function of the main back muscles was protecting the thoracolumbar spine form an amplitude of movement that would exceed the thoracolumbar column’s possible range of motion. Carlson used the term “stiffening” of the back muscles in line with recent studies referring to large diversity in elastic stiffness across vertebrate muscles. Real science is the factual documentation of test hypothesis. In equitation, as in life, provisional hypotheses need to be tested with advanced knowledge. Intuitive riders would be better served if, instead of perpetuating deceitful theories such as driving the horse onto the bit and rebalancing with the half halt, classical equitation would further check the wisdom of our predecessors with actual knowledge. It would be much more efficient if gifted riders and gifted horses could learn how harmonic tensegrity between the rider and the horse can optimize storage and recoil of elastic energy. It would be much more useful if intelligent riders were taught about the importance of frequency and progressive increase or decrease of muscle tone. From gross anatomy down to fibers composing the muscles, respect of the horse’s frequency or cadence is a perquisite to any efficient education. It takes a long time to create beauty and elegance and mutual love and soundness, because science has to correct the meaning of the paraphrases and metaphors describing our ancestors’ thoughts. Also, because science furthers these thoughts, the horse’s willingness and capacity to process complex thinking is exposed and at a level that was previously unknown. Instead of obedience, the horse’s comfort zone is a partnership where, through harmonic tensegrity, the rider guides the horse’s mental processing toward the body coordination optimally adapted to the athletic demand of the performance. It takes a long time but, what a journey!